The Wales star has been repeatedly linked with a move to Old Trafford. Gareth Bale isn't keen on moving to Manchester United and doesn't want to leave Real Madrid, according to reports. The Welshman has been constantly linked with a move to Old Trafford with Ed Woodward desperate to bring the Wales talisman to Old Trafford. 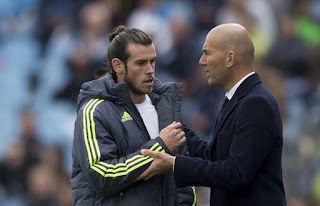 Over the summer it looked as though Woodward may be successful as Bale appeared to be unhappy in Madrid having not been an automatic selection under Zinedine Zidane. But, when the Frenchman left the club Bale decided to stay and has started regularly this season for the La Liga giants report the MEN . Telemadrid suggest sources at Real Madrid have confirmed club hierarchy are fed up with the Wales international and have lost patience with the winger. According to the report Real Madrid representatives believe the player is wrongly prioritising himself ahead club matters, and the La Liga club are understood to be disappointed by Bale’s decision to travel to Wales for his countries friendly vs Spain. But any hope United reportedly had has been dealt a blow as the Express claim Bale has no plans to return to the Premier League any time soon and is happy to stay in the Spanish capital.